The 2014 Award for Young Volunteer of the Year went to Rebecca O’Reilly, a leader in Foróíge Skerries. This annual award honours the memory of Jim Quigley and acknowledges the work of outstanding volunteers. 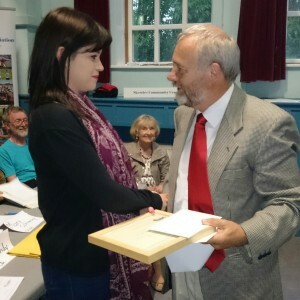 Martin Russell, chairperson of the Skerries Community Association, presented the award to her at the SCA’s AGM on Thursday 27 June. The judges were particularly impressed with the dedication Rebecca has toward the club and its members. She goes out of her way to make everyone feel a part of the club each Wednesday. Rebecca has been on every trip with Skerries Foróige and is doing everything she can to get them involved with the community. Recently she gave up two Saturdays to help build and paint bird boxes with 5 of the young people for Skerries Tidy Towns, a fact that was particularly stressed by Mary Conway, Hon. Secretary of the SCA, who read the profile about Rebecca at the AGM. 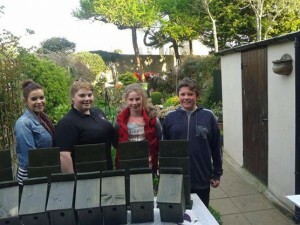 Mary is also a member of the Skerries Tidy Towns Committee and says that they were very impressed with the bird boxes. Skerries Community Association wishes Rebecca, who has recently finished college having studied community development and really wants to continue her work within the community, all the best in her career and is looking forward to her future involvement in Skerries. Rebecca O’Reilly, far left, with Foróige members and their bird boxes. For more on Jim Quigley, as well as a list of previous winners, see our page on the Jim Quigley Award.